But that’s not possible on the Mac. So I had to find another way. 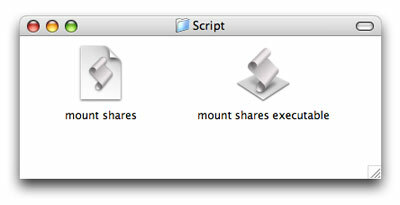 The easiest way is to write a script that is executed at startup. And so I did. 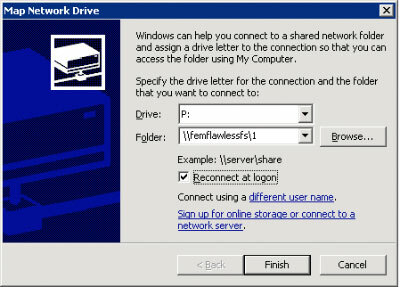 Whereas “smb://” is the protocol and “bietiekay” is the username followed by the servername “femflawlessfs” and the share name “1“. When you did that you can check if it works just by clicking on the “Execute” button in the icon bar of the script editor. Normally you’ll be asked for a username+password. If so enter your username and password and add it to the key chain by activating the checkbox in the username+password dialog. 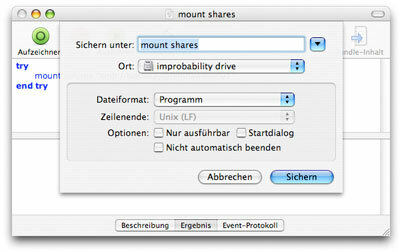 You have to do that to allow the script to mount the share without asking you for the username+password again the next time it runs. 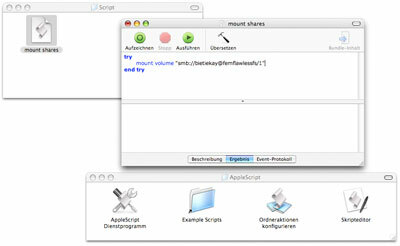 Now you have a script and the executable application. Go to the “Apple menu->System Configuration->Users” dialog where you can configure the applications that run at startup/login. 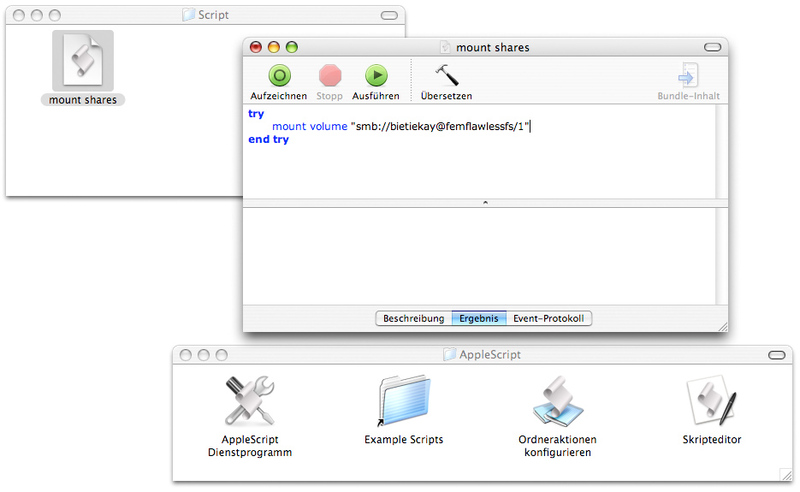 Click on the “+” symbol under the startup list and select the application you just made with the script editor. That’s all. You’re set-up to test this… start your machine and see if it works. Sorry für die doofe Frage, aber es interessiert mich wirklich. Kannst Du mir sagen wie das Skin heißt oder mir vielleicht sogar einen Link schicken, welches Du da benutzt? uff, ich hab keine Ahnung mehr. Das is schon ne Weile her und ich benutz es im Moment nichtmehr. 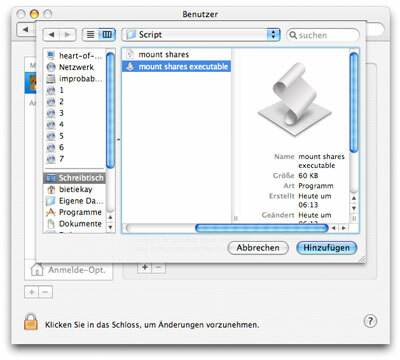 Es gibt Skin-Sammel-Seiten für WIndowblinds. Da schau einfach mal. Normalerweise reicht es, das Icon des Volumes zu den Startobjekten zu ziehen. Wenn du dann die zugangsdaten in der keychain hast, sollte der kram beim einloggen gemountet werden. 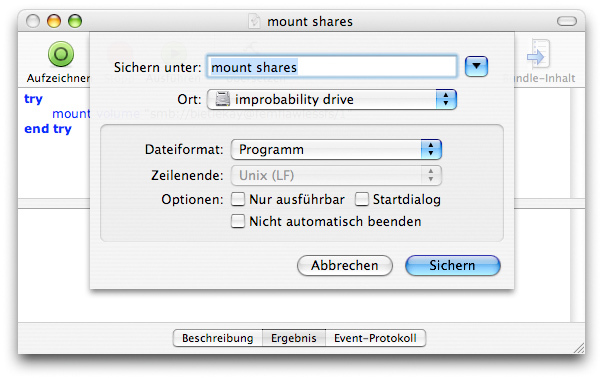 et voila: the share will mount on boot even without asking for a password. Being a switcher about a year ago I could not think of such a simple and elegant solution myself and read it somewhere on a blog.